Grainger Public Relations » Digest This! A sample of local experts will be getting to the bottom of digestion in Dundee this weekend (Saturday 11 February 2017). L-R: Gordon McDougall (James Hutton Institute), Henry Rae (University of St Andrews), Heather Barnes (British Science Association, Tayside and Fife Branch) and Jordan Young (Dundee Science Centre). In Dundee Science Centre’s first ‘Meet the Expert’ event of 2017, visitors will get the chance to explore how both humans and animals digest their food, and what can go wrong. ‘Digest This!’ complements ‘The Scoop on Poop!’ – the ongoing family show which runs through to Sunday 26 March 2017. Events are included as part of normal admission. 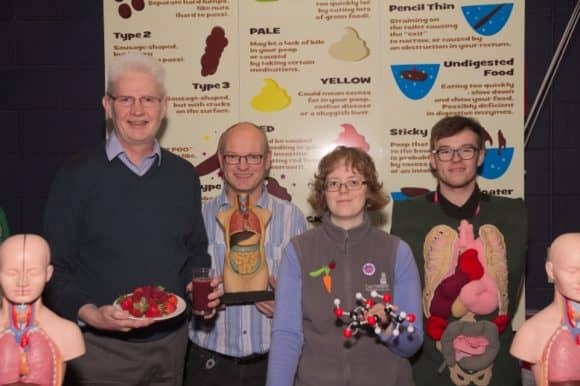 Henry Rae and Sharon Carstairs, nutritional researchers from the University of St Andrews will be delivering hands-on digestion shows at 11am and 1pm. Giving a fascinating overview of the digestion system using torso models, visitors will go on a digestive journey, from the time food enters the mouth until it exits the body. There will be interactive demonstrations on taste and a race to see how quickly our audience can move food through our lab built intestines. Meanwhile, research scientist Gordon McDougall from the James Hutton Institute will be delivering his talk: ‘Berries, Bioactives and Digestion – How does the good stuff do you good?’ at 12 noon and 2pm. There will also be lots of drop-in activities from 11am until 3pm, with the British Science Association demonstrating ‘Eating for Health’ with the help of a body composition analyser, an interactive insight into the fat and sugar in our food and some fruit samples to try. Coeliac disease will also be explored, with ‘Engaged Researcher of the Year’ Professor Jenny Woof from the University of Dundee offering a mock experiment and food sorting game, revealing the features of a healthy immune system and what happens when someone with Coeliac disease eats food containing wheat, rye or barley. Putting humans aside, RSPB staff will discuss raptor digestion, particularly white tailed eagles, which can be found throughout Tayside. Visitors will get the chance to guess what birds have been eating by examining their pellets. Full details of this year’s ‘Meet the Expert’ events, which take place on the second Saturday of the month, can be found at www.dundeesciencecentre.org.uk. Alternatively, telephone 01382 228800. Dundee Science Centre is open daily from 10am-5pm. Grainger PR was launched in 2007, a natural progression from Claire Grainger's varied and impressive career in PR and journalism. Grainger PR works with a diverse range of clients in a combination of sectors, from science and property to healthcare. Explore some recent client case studies, and see what Grainger PR is doing for clients, and what the consultancy could do for you.